Ask The Bellwether: How can I spin on a budget? How can I spin on a budget? 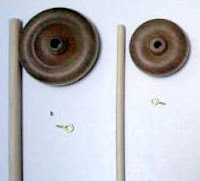 First off -- you can make your own toy wheel spindle. Toy wheels actual have decent-to-good spindle physics. The spindle that taught me to spin silk was a lollipop spindle, which is "nothing more" than a 2 inch diameter toy wheel on a 1/4 inch diameter dowel -- with a lovely paint job. Then, you can make your own PVC niddy noddy, or even a coat hanger niddy-noddy, or just use your arm for a 2' skein or your foot/knee for a 3-4' skein. To make a coat-hanger niddy-noddy, take a metal coat hangar, and pull down on the lower bar at the mid-point to make it a diamond shape. You then wind your yarn around the hangar in those indents, over-under-over-under each diamond point, making a skein. It's bendable, so you can bend it to get the skein off. Great for re-skeining wet yarn, since it's not wood! A nostepinne can be made from a hardware store table leg -- look for a nicely tapered leg for a coffee table. Or, you can simply wind around a wooden dowel, or, for that matter, around your thumb! 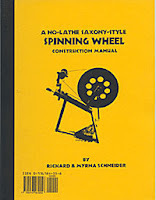 And if you get very into spinning, there are books on making your own wheel. (I'll get them back up on thebellwether.biz really soon...) Spin-off also offers online plans for cigar box charkas and little great wheels. So that leaves the stash ... how do you avoid ending up with all that stash spinners keep going on about? It takes alot of will power, and I'll admit I didn't succeed. I have stash. If I could start spinning over again, that would be the one thing I'd change! If I had one thing I'd do differently on the path I have taken in my spinning adventure, it would be to amass less stash. There's so much prepared fiber and raw fleece in my house now, it's easier to buy something new for a project I have in mind than look through all that's here. But I can't "casual shop" at shows any more for fibers that intrigue me, knowing there's nowhere left to stash it at home. I think this was hammered home to me by a lady that came to my booth at Black Sheep about two years ago -- she said, she was buying fiber "for the year" -- she knew how much she needed to have fiber on hand for the following year, she knew she'd spin through it, and she knew she could do the same again next year. Now I find myself spinning things without knowing what they might become -- so my yarn stash is getting similarly out of hand. Ah well ;-) at least I don't need to worry about a fiber drought any time soon. This is one of those "happy problems", right? And it does mean I'm happier to enable new spinners by donations from my own stash. If you're a new spinner on a budget, you can look for fiber that is lower priced, but be sure it is still good quality. For example, a "medium wool domestic top" may sell for less than "Targhee" (which is medium wool and likely domestic, but since it's a specific breed, it has more value). Also, a mill near me, Fantasy Fibers, sells "beast" roving at shows, which is a mish-mash of a variety of fibers usually in wonderful natural shades, though she also occasionally has colored beast too. It's her least expensive roving, still processed on her equipment so it's nice stuff. And if you do get a hankering to spin merino, cashmere, and other really fine fibers -- it doesn't take much to make a bunch of laceweight, so use these fibers for your fine spinning. Plan a lovely 4 oz. shawl -- you'll be spinning forever (ok, I'd be spinning forever!) with just 4 ounces of merino. If you're offered free fleece (getting the word out that you spin usually results in this!) feel free to take it -- but be prepared to toss it or use it as mulch (or put it in those plastic net wrappers onions come in with a string to tie onto a tree branch and sell it as "bird bedding" at your local farmer's market for $5 an ounce, LOL!). If it has breaks in it, is just too mucky to get clean, or too full of VM, don't torture yourself with it -- learn from it and move on. At least one spinning list (spindlers) has a trade day -- currently Fridays. I've traded fiber for homemade biscotti, fudge, and soap -- so if you have something you can easily (on a budget) make, you might consider barter for some fiber. The exchanges on the various spinning lists are also fun. I mostly enjoy the ones where everyone gets some of every one elses' things. spindlers had a breed exchange, and spinning_on_the_edge had a fiber sandwich exchange, in 2007. A great place to find second-hand equipment is The Spinners' Housecleaning Pages.